Because you know what, Tinette isn't scary enough unless she's traveling around on a giant carnivorous creature. I haven't named him yet. I haven't RPed in a while, so I'm exploring hilarious and extravagant things I can make my characters do that I probably can't do in an RP because it's too late or out of world or something. In my world, she's perfectly capable of owning this thing. Probably pulls her sham fortune cart in the caravan or something. 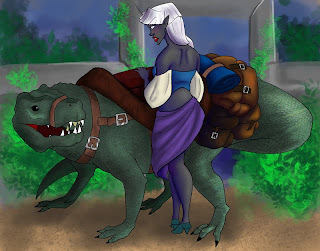 This is what came out of my last post of Tina riding an alligator; I decided an alligator was too close to the ground for Tinette's comfort, so now she gets to ride around on a... uhm... Postosuchus, one of the earlier dinosaurs. It's basically a hybrid of a tyrannosaurus and an alligator, so it wins. Anatomy fail. I really don't care, I made it up. Messy backgrounds are messy. Not to self, plan and draw a background before I colour a picture; it makes the painting process ten million times easier. So until I remember that! Messymessymess.